homeless population across the region. our work is needed more than ever. we will inevitably see results. experiencing the crisis of homelessness in Los Angeles County. But numbers don’t tell the full story. Behind every number is a person who has been impacted by of homelessness in LA. We have so much to be thankful for—especially you. 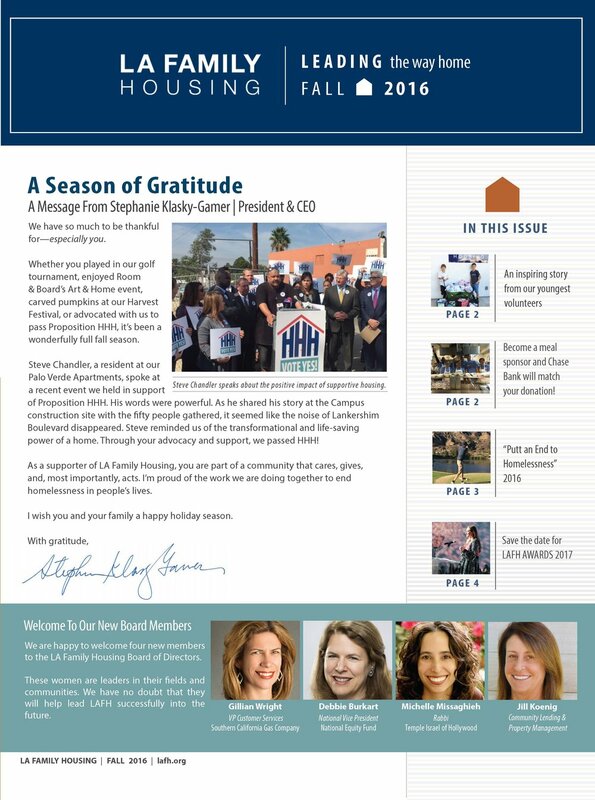 Whether you played in our golf tournament, enjoyed Room & Board’s Art & Home event, carved pumpkins at our Harvest Festival, or advocated with us to pass Proposition HHH, it’s been a wonderfully full fall season. Thirty years ago, a group of local leaders saw a growing crisis of homeless families in the San Fernando Valley, and they made it their mission to help. Together they purchased the old Fiesta Motel on Lankershim Boulevard in North Hollywood and gave 40 families a new beginning. That motel became Valley Shelter, the first crisis housing in the area and a key foundation to what became LA Family Housing (LAFH). Tonight, most of us know where we’ll rest our heads. We have pillows on our beds, and we can sleep soundly in our homes. For so many of LA Family Housing’s clients, this isn’t the case. Two years ago, we were seeing 10-15 families walk through our doors for help each month; this year, we’ve seen up to 50 homeless families each month. And with our expanded outreach program, our case managers are also seeing an increase in homeless individuals on the streets. The need is greater. But the solutions are in sight, and we’re making a real impact. Thank you for joining us in action and support every day.